Could I Fall Overboard During My Cruise? 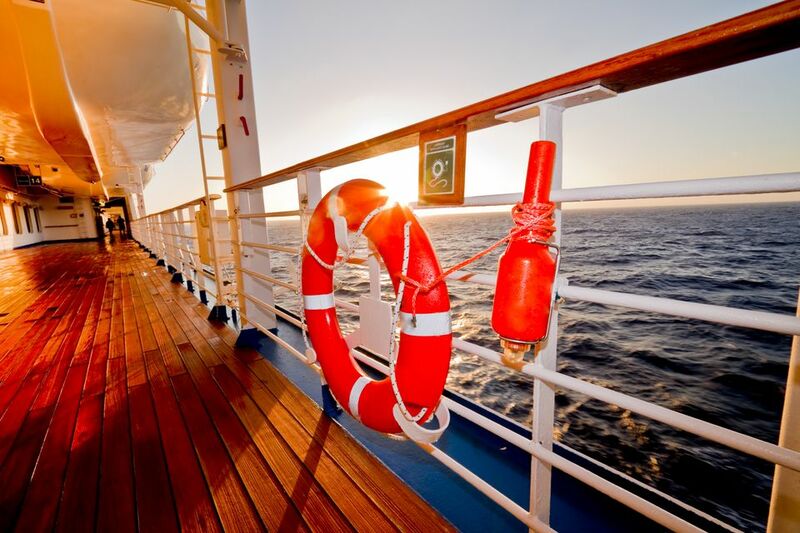 How easy is it to fall overboard during your cruise? It's not very likely, in spite of the heavy media coverage of "man overboard" incidents. In fact, the biggest risk to your safety during a cruise is not falling over the ship's side. You are far more likely to become ill, particularly from the norovirus, while you are at sea than you are to fall into the ocean. Cruise ship railings are typically about four feet high. Even for a tall person, that means the railings are at or above waist height. Therefore, falling overboard is extremely unlikely unless you are engaging in risky behavior, such as excessive drinking or climbing from balcony to balcony. Cruise ships that embark passengers at US ports are inspected by the United States Coast Guard during their first port call and quarterly thereafter. These inspections cover structural and fire safety, lifeboats and life preservers, crew training, and shipboard drills. In addition, passenger ships calling at US ports must comply with International Convention for the Safety of Life at Sea (SOLAS) requirements. The International Maritime Organization (IMO) adopted the SOLAS Convention shortly after the Titanic disaster in 1914. The SOLAS Convention spells out passenger ship safety requirements, including required numbers and types of lifeboats and specifications for smoke detectors and fire suppression systems on new and existing passenger ships. In addition, the SOLAS Convention details the specific search and rescue procedures cruise ship captains must follow. The IMO also issues standards for crew training. These standards, called the International Convention on Standards of Training, Certification and Watchkeeping for Seafarers (STCW), include specialized training for passenger vessel crew members on crowd management, safety, and crisis management. Avoid drinking to excess. Do not use illegal drugs. Do not engage in horseplay near the ship's railings – or anywhere else on the ship, for that matter. If you absolutely must take a selfie, stand on the deck, not on a railing or table. When taking a selfie on the pier, stand far from the pier's edge so that you don't accidentally fall into the water between the pier and the ship. Notify the ship's doctor if your traveling companion expresses suicidal thoughts. Try your best to convince your companion to seek help. If you have suicidal thoughts, talk with the ship's doctor or call the National Suicide Prevention Lifeline at 1-800-273-8255. You can also text the Crisis Text Line; simply text CONNECT to 741741 (in the US) to chat with a crisis counselor. In Canada, text HOME to 688868. Never boost fellow passengers, especially children, onto railings or tables for a better view, and do not climb onto railings or tables yourself. Your chances of survival increase greatly if you know what to do once you hit the water. Get to the surface as quickly as you can. Call for help. Look for something to hang onto while you float, such as a piece of wood or plastic. If the water is cold, conserve body heat by curling your body into the fetal position (a ball). Do not flail about, as you will lose body heat and increase the possibility that you will develop hypothermia. If the water is warm, there is a possibility you will encounter sharks. Do not thrash around in the water, as you will attract their attention. Try not to urinate, for the same reason. Once a shark has noticed you, try to slowly and carefully back away. If the shark becomes aggressive, make yourself as large as possible, maintain eye contact with the shark, and fight back if it attacks. Pay attention during the lifeboat drill and follow all safety instructions issued by the crew during your cruise. Above all, use common sense. If you would not climb onto a railing or other structure on land, do not do it while at sea.